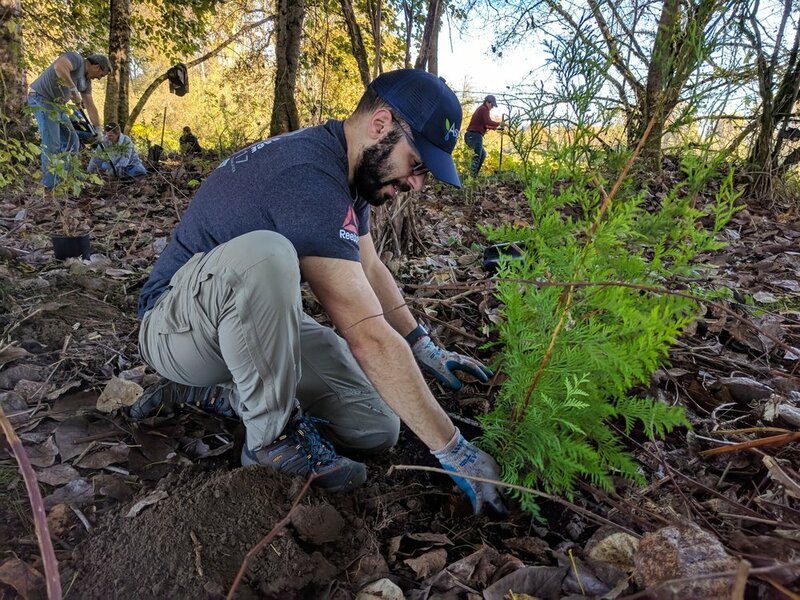 Taking advantage of a day out of the office during our Seattle office move, the Aspect Community Team (ACT) partnered with Stewardship Partners and Carnation Farms to help with their ongoing riparian restoration efforts along the Snoqualmie River. It was a sunny, beautiful October day, and the fall colors were rich throughout the valley. Eleven employees make the trek to Carnation and spent a few hours planting shrubs and trees including western red cedar, snowberry, salmonberry, and cottonwoods. We had help from four stewardship partner field crew who also placed cottonwood stakes among the trees and shrubs. Aspect’s volunteer staff donated their day to plant over 900 trees along the Snoqualmie River to help Stewardship Partners and Carnation Farms. In 1908, the first 360 acres of farmland were purchased, and Carnation Farms was created. Now the farm totals 818 acres and includes an 8-acre organic garden, educational programs, event space, hiking trails, and is bordered by a stretch of the Snoqualmie River. A byproduct of the agricultural growth in the region was the destruction of the natural riparian ecosystems along the river throughout the valley. 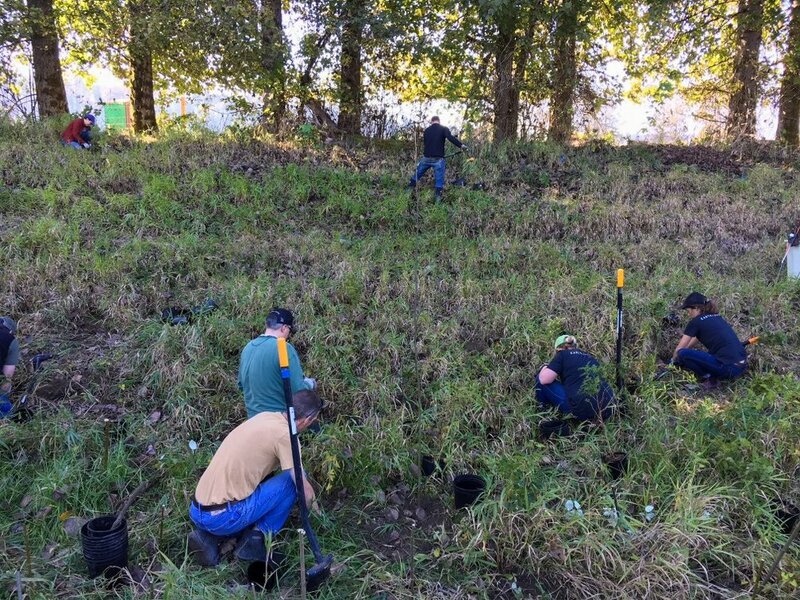 Stewardship Partners has been working with Carnation Farms to restore the habitat along the Snoqualmie River as a component to their adopt-a-buffer program. Why is riparian habitat restoration important? Planting native trees and shrubs is the primary component of restoration and maintenance of healthy riparian ecosystems. As Stewardship Partners explains, the strips of native trees and shrubs provide cooling shade, control erosion and provide habitat for hundreds of fish and wildlife species. Trees and shrubs actively absorb air pollution throughout their lifetime, storing carbon and fighting climate change. What is the impact of a half-day of service? In about 3-4 hours of diligent work we planted 960 shrubs, trees, and stakes across approximately 0.5 acres of riparian habitat along the Snoqualmie River. This effort would have taken at least a week without the ACT volunteers. Stewardship Partners will do some maintenance the area and in about a year we should be able to see if our efforts truly take root. Aspect has partnered with Stewardship Partners previously for the design and installation of the Carnation Elementary School raingarden. The raingarden installation is part of a greater 12,000 Rain Gardens effort, and Aspect is also in coordination for another volunteer raingarden project! Stewardship Partners has been a great organization to work with and Aspect is a proud supporter-- pro-bono technical design, education and consulting services, volunteer labor, and funding. Over this past summer, Aspect’s Owen Reese was invited by Stewardship Partners to provide pro bono design for a pair of rain gardens at Carnation Elementary School. The project is part of a long-standing partnership between the Snoqualmie Tribe and Stewardship Partners to plant and promote native species and educate communities on water quality protection. The goal of this demonstration project is to improve infiltration, replace non-native vegetation, and create wildlife habitat. The rain gardens will infiltrate runoff from approximately 6,500 square feet of the school’s roof. This fall, several Aspect staff, along with volunteers from Stewardship Partners and Carnation Elementary School, gave a Saturday to prepare the rain gardens for planting by shoveling dirt to create the final shape of the rain gardens and place 4 tons of river rock to line the conveyance channels. It was great fun and a good workout! The school kids will be planting the rain gardens in a few weeks, incorporating native plants selected by the Snoqualmie Tribe as culturally significant. Check out Aspect’s Dave Cook and his pitch to “Engineer with Soul” in ACEC’s Engineering Inc. issue this month: http://www.nxtbook.com/nxtbooks/acec/engineeringinc0917/#/50. Aspect’s Principal Geologist Dave Cook will man the “Resume Review” station at the University of Washington’s College of Engineering Career Fair Prep Night on January 10. Dave will be giving out free advice to hopeful future professionals on what to do and, most importantly, what not to do when engineering an inviting resume for the working world. Learn more HERE.